Choose exactly who will see your recruiting screener. Let's say you only want people in a certain set of countries to participate in your research, or only people with certain browsers, or even mobile users - you can now have ethnio automatically hide your screener from people that don't match your basic technical criteria. The things you can automatically target are mobile device, browser, location, and operating system. Basically, if it's a type of information most browsers share by default, then we can let you use that to specify who you recruit for research. 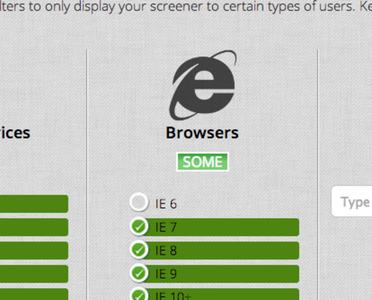 So let's say you don't want any IE6 users to see your fancy responsive screener, go to Screeners >> 7. 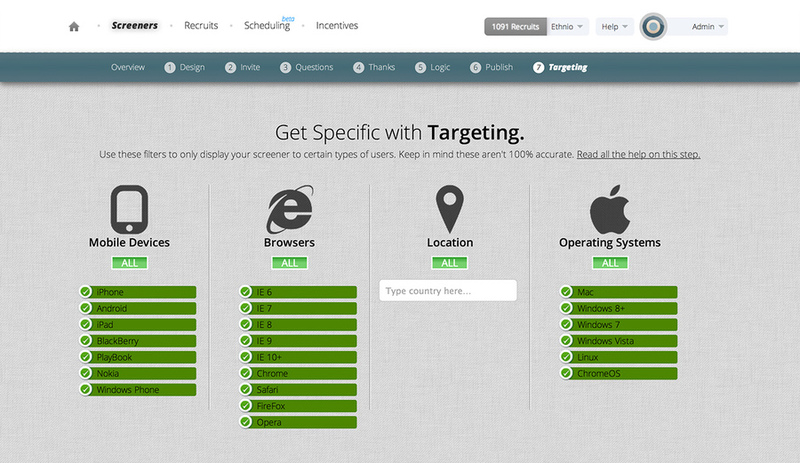 Targeting and un-check IE6 to make sure that nobody with that browser will see the screener. Not every browser returns these strings of data accurately, so it's important to note that targeting doesn't have 100% accuracy. But if you're interested in testing the accuracy for your own technical environment, simply add a screener question like "What browser are you using?" and make sure the dropdown answers include IE6. Theoretically you should never get anyone picking that answer, or at least very very few people. Let us know if you have any questions and look forward to hearing if this is helpful!